What types of pool cover are available? There are different types of pool cover available, each designed with slightly different benefits and advantages in mind. Heat retention covers are most suitable for indoor pools and mean that you use less energy to keep your pool warm; a solar cover on an outdoor pool will actually warm the water. A winter debris cover protects your pool when it’s not in use and during the winter season. Safety covers and slatted covers put a barrier over your pool’s surface to keep people and pets safe as well as providing some of the benefits of other types of pool cover. A heat retention pool cover or blanket on an indoor pool can save up to 85% of the total heat loss from the pool. The cover also cuts down significantly on evaporation, which means that you use less chemicals and it is easier to keep the chemical balance of your pool water at the correct levels. Less evaporation also means less condensation. There is less moisture in the air in your poolroom so maintaining that space in the long-term becomes a less expensive task. On an outdoor pool, a solar cover absorbs heat during the day and then retains the heat at night. A solar cover looks like a huge sheet of bubble wrap. This solar blanket floats on the surface of your pool and transmits the suns energy through the sealed air cells. Most of that heat is then retained and a solar pool cover can increase the water temperature dependent on location, by as much as 12 °C during the season. It’s easy to see why such simple and effective technology makes it the most popular type of outdoor pool cover. Most solar pool covers are blue on the top to help absorb the suns rays and some have a silvered under surface, which increases their heat retention capacities. Some solar covers are fitted with a floating leading edge that keeps the cover in shape and increases it’s life expectancy. Rollers can also make it much easier to handle on and off your pool. A winter pool cover is made of a very fine mesh to keep all sorts of debris out of your pool during the off-season when it isn’t being used. The mesh cover is usually held in place by webbing straps and tension springs. It will sit on your pool all winter and go some way to protecting your pool from any possible frost damage. Although the cover is fine enough to keep most dirt and debris out, it is water permeable so rain will get through rather than sitting on the surface. Because of that, it’s a good idea to drop the water level of your pool below it’s usual mark to allow for the rainwater. Ultima is an automatic, four seasons cover from DEL that completely covers and secures your pool. Working as both a safety cover and a protection from debris, Ultima can be specified for a new build or retrofitted to an existing pool. Ultima is suitable for pools up to 7 x 14 metres. Its twin hydraulic motors allow it to close over a 9-metre pool in less than a minute. The Wi-Key digital remote control box operates the cover. The most basic safety cover is essentially a reinforced winter cover being a dense mesh cover that is held in place by straps and webbing. Strong enough to support the weight of more than one adult, they will also keep your pool safe for pets and animals. Other types of safety cover include those which use aluminium poles sewn into a fabric cover and which sits across the surface of your pool up to a fully automated system that will cover your pool in minutes at the touch of a button. Pool safety covers are appropriate for both indoor and outdoor pools and are especially important if access to the pool isn’t restricted by a fence or lockable door or gate. Slatted pool covers use a number of hollow slats that are automatically drawn over the surface of your pool to provide a number of benefits. The slats come in a variety of colours including solar options that will collect heat during the day. Obviously the slatted pool cover will protect your pool from dirt and debris. It will also lower heat loss and evaporation so you are using less energy and fewer chemicals. In many people’s minds, a slatted pool cover is also the most aesthetically pleasing of all the pool cover options. The majority of slatted pool covers float on the surface of the pool and can either be designed in from new or retrofitted to an existing pool depending on which actual model you choose. DEL make a wide range of slatted pool covers. The range covers built in and retrofit options, automatic -either mains or solar powered – or manual covers and they are available in a variety of styles to blend in with any pool installation. DEL PVC slats all carry a 3 year guarantee. They have excellent buoyancy and are resistant to fading and staining. The 69 mm slats come in a range of colours: white, beige, blue and grey and matched end caps are, of course, available in each colour. There is also a polycarbonate ‘solar’ option in five crystal colours including clear, green, blue, brown and black. The PVC end caps now also come in a range of radius curves that allow the cover to follow the lines of your pool more closely for a better aesthetic and increased safety. DEL polycarbonate slats have a 5 year guarantee and are a ‘solar’ slat in that they help absorb the sun’s warmth and transmit that heat to the water of your pool. 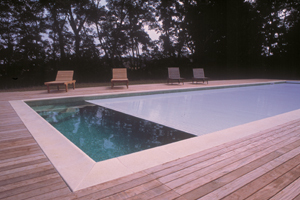 All DEL slatted covers can be shaped to the precise dimensions of your pool to accommodate Roman ends or steps. This shaping is done at the factory and the cover is delivered ready cut. A DEL slatted cover will help keep your pool free of dirt and debris, cut down evaporation and therefore chemical use and can also be locked in place as a safety cover. All DEL slatted covers can incorporate locking devices to significantly improve the safety of your pool when not in use and unattended. As you can see, there are many different ways to cover your pool dependent on size location and personal taste but we hope that this article has been useful in helping you make your choice. How did you cover your pool? Let us know, in the comments box below. If you would like some specific advice then we can help you find a pool professional with the appropriate skills and experience right for you. There is a link at the top of this article that can get that process under way.